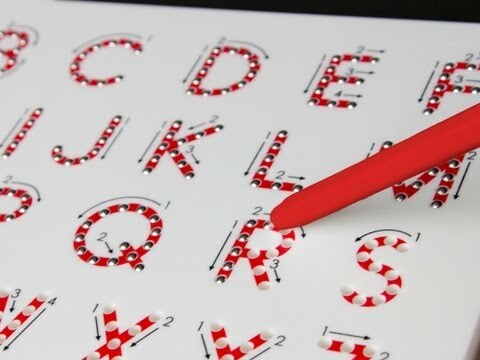 A magnetic stylus pulls beads up to create solid lines. Kids writing their first letters will get helpful up, down and sideways instructions via easy-to-follow arrows. Erases with the tip of a finger. As a wise woman once said, “In every job that must be done, there is an element of fun, find the fun and snap the job is a game”. Magnatab does just that. 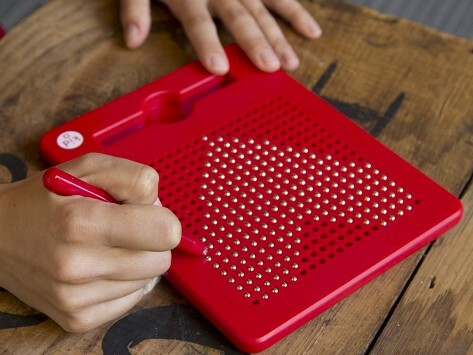 It’s a magnetic board and stylus that put the fun in learning how to write the alphabet and form numbers. Inspired by Montessori’s sandpaper tracing letters that enable kids to feel the shape with their fingers thereby committing the form to muscle memory, Lisa Mahar came up with the idea for Magnatab. With the help of directional arrows to provide guidance, children use the stylus to trace letters and numbers correctly. As the stylus makes contact with the board, it creates a magnetic pull that brings the beads from within the board to the surface, providing sensory reinforcement as the forms take shape. To clear the board, children must use their finger to push the beads down, a tactile experience that further aids the learning process. Magnatab is also available in a freehand version. Whichever board you choose, the stylus helps develop the fine motor skills necessary for grasping a pen or pencil. Magnatab is just the thing for kids who love to play and grown ups who want their children to love to learn.